SAS (Statistical analysis system) is one of the most popular software for data analysis. It is widely used for various purposes such as data management, data mining, report writing, statistical analysis, business modeling, applications development and data warehousing. Knowing SAS is an asset in many job markets. It is tagged 'leader' in Advanced Analytics Platforms as per Gartner 2015 and 2016 reports. The following tutorials are designed for beginners who have no programming background or new to SAS programming language. These tutorials explain how to download and install SAS software and how to get started with SAS. These tutorials are intended for people who are new to SQL programming language. PROC SQL is an advanced SAS procedure that helps to run SQL queries to manage and manipulate data. These tutorials include Introduction of SQL with examples, PROC SQL Joins, conditional statements and useful tips and tricks of SQL etc. These tutorials provide useful guide for learning SAS Macros. It includes useful tips and tricks of SAS Macro programming and outlines real world examples of SAS Macros. It helps you to get your hands dirty with practical SAS coding examples. You would both learn and practice by understanding these examples. 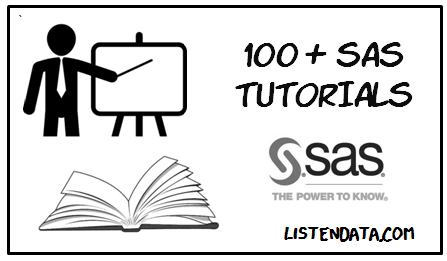 These tutorials would help you to understand data and statistical analysis with SAS. It includes tutorials on performing descriptive and inferential statistics, linear and logistic regression, time series analysis, variable selection and reduction, cluster analysis and predictive modeling with SAS etc. These tutorials outline the sample SAS Base and SAS Statistical Business Analyst certification questions and answers which helps you prepare for the certification. All questions asked are multiple choice questions, in which there is only one correct answer. It includes questions on SAS functions, procedures, data management, ANOVA, regression, predictive modeling and report generation etc. It covers more than 50 most frequently asked base and advanced SAS interview questions and answers. It is a collection of SAS Interviews questions beneficial for both freshers and experienced programmer. It includes tips and techniques to create common graphs or charts with SAS. It also provides methods to decorate charts so that they look professional and add WOW factor to your presentation.